In September of 2012, Little Brother Luke first met Steve McLaughlin, his soon-to-be Big Brother, after enrolling in their local Big Brothers Big Sisters program in Pinellas County, Florida. Looking for an opportunity to engage in new experiences and activities, Luke’s matching with Steve would prove ideal. Luke and Steve like to spend some of their time together working on all sorts of projects, so it should come as no surprise that when they discovered a beat-up old go-kart, the two knew that would be a worthy project for them to take on. 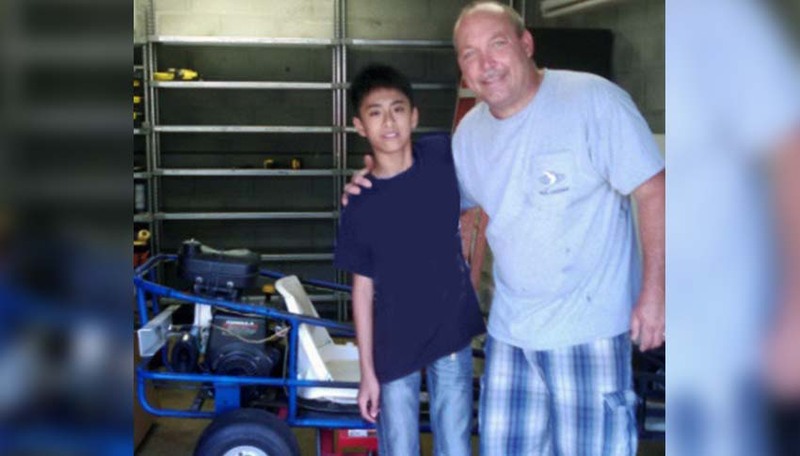 While it was no doubt a challenge, requiring a new carburetor, spark plugs and brakes, they enjoyed the experience, and through their dedication to their project, ended up with a fully-functioning go-kart. Luke and Steve also enjoy going out to eat, watching movies, attending church together and playing cards. They also went fishing where Luke learned how to properly cast a reel. By the end of the day, he had caught his first fish! For all the new experiences and fun times Luke has with his Big Brother, they both agree that the best times together are those spent simply laughing and joking. Steve laughs when remembering Luke’s attempts at teaching him to use chopsticks, noting that while he has not had much success, he is still practicing! With the support of volunteers, like Steve, and donors, Big Brothers Big Sisters continues to strive to provide professionally supported, one-to-one mentoring relationships to children like Luke across the country.